Manchester VT Recent Listings | Josiah Allen Real Estate Southern Vermont's Leading Independent Brokerage. Since 1962. Discover recently listed real estate for sale in Manchester, VT. Search through a variety of listings including acres of land, residential homes, and more. Save your favorites when you create an account, and you can get email updates when new properties match your search criteria. For more information and to schedule a showing, don't hesitate to contact us. Are you looking for a home in mint condition, a place to unlock door and unpack? Then this home should not be missed. Owner has not missed one detail when building and maintaining this home. Built in 1985, home has newer Andersen Low E windows (glass is 56% more energy efficient in summer and 47% more energy efficient in winter as compared to ordinary dual pane glass). Newer roof. Ceiling fans. Trek decking on front porch with concrete pillars, Trek decking on back patio. Crown molding and wainscoting.Town water. Views of Prospect Mountain. Newer kitchen, Corian counters.Basement is dry and insulated. 625 sq ft just waiting to be finished for more living space. Commercial grade wall AC unit, 24,000 BTU. Heated garage. Manchester Center - Charming Cabin Like Home Nestled in the Woods. 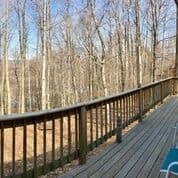 Charming cabin in a wooded setting with privacy and convenience to Manchester, the Mountains, and more! 2 bedroom and 2 full bath sleeps 7 comfortably. Open kitchen and dining area on main floor with fireplace and sliding glass doors to a lovely deck. Ground level has additional bedroom, bath, and extra sleeping quarter. Bonus 2nd living space downstairs with fireplace. Pets considered with extra deposit. Cleaning fee required. Monthly plus time period is required for summer rental.